Solar panels are a popular product these days, and there are many criteria to consider when deciding which panels to purchase for your solar energy system. As you explore solar panel reviews, it is important to include solar cell efficiency, solar panel ratings, durability, and manufacturer assurances in your decision. 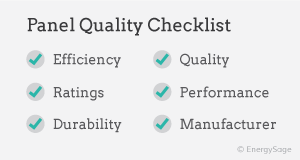 Below, EnergySage has outlined the factors to keep in mind when you are evaluating solar panel performance and quality. You don’t need to know exactly how solar panels convert sunlight into electricity to make a solar purchasing decision. However, understanding how a solar panel will perform is key to determining how much you can save with your solar energy system. All solar panels receive a nameplate power rating indicating the amount of power they produce under industry-standard test conditions. Most solar panels on the market have power ratings in the range of 200 to 350 watts. A higher power rating means that the panels are more effective at producing power. The nameplate rating represents the power output under ideal conditions, which most solar power systems won’t experience for more than a few moments at a time. However, solar panel ratings are useful as a way to make consistent comparisons between panels. Nameplate power rating is one of the factors that determine how much power your solar panels produce, but there are other factors that can also influence electricity generation. 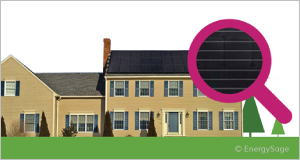 Take a look at EnergySage’s guide to understanding how much power a solar panel produces. As solar panels are manufactured, some unavoidable variations that impact power output are introduced. Power tolerance indicates how the power output of a solar panel might differ from its nameplate rating. They are typically expressed as a plus-or-minus percentage. For example, a 250-watt panel with a +/= 5% power tolerance could actually produce anywhere from 237.5 watts to 262.5 watts under ideal conditions (as 12.5 watts is 5% of 250 watts). A narrower power tolerance range is preferable to a wider one, because it represents more certainty. Power tolerances should be viewed in tandem with solar panel ratings. Solar panel efficiency represents how effectively a solar panel can convert solar radiation (e.g. sunlight) into electricity. The most efficient solar panels commercially available today have solar panel efficiency just above 22%. 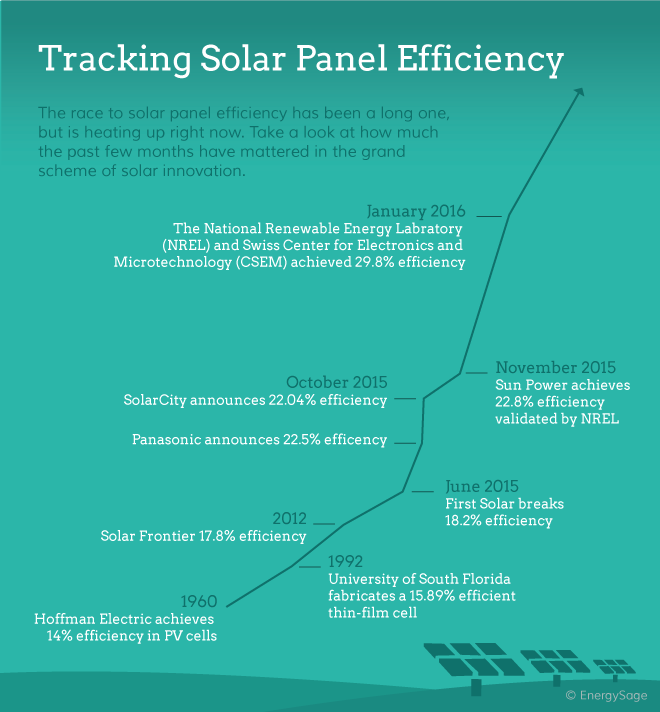 The graphic below shows how dramatically solar panel performance has improved over time. A higher solar panel efficiency rating means a panel will produce more kilowatt-hours of energy per watt of power capacity. Because one high-efficiency panel can generate more electricity than a similarly sized panel with a standard efficiency rating, efficiency is particularly important if you have limited roof space and large energy bills. * For the sake of simplicity and universal comparison, EnergySage uses aperture-efficiency and module-efficiency interchangeably and gives the two technologies equal weight in this analysis when referring to the operational term “efficiency”. Should you wait for higher solar panel efficiency? Every few months, another solar manufacturer makes headlines by announcing that they’ve created the “world’s most efficient solar panel,” leading many homeowners to wonder, are high-efficiency solar panels worth the wait? On the EnergySage blog, we break down why now is the time to go solar, even though solar panel efficiency will continue to increase in the months and years ahead. Although solar panels are designed to love the sun, high heat can actually reduce a solar panel’s capacity to generate power. The temperature coefficient quantifies how a panel’s power capacity decreases at temperatures higher than 77°F, which is the standard temperature at which tests are performed. For example, many standard grade solar panels may produce 1 percent less electricity for every 4°F temperature increase above 77°F. Panels with less sensitive temperature coefficients will perform better over the long term. Check solar panel ratings and reviews carefully for the temperature coefficient, particularly if you live in hotter parts of the country. The International Organization for Standardization (ISO) has created quality assurance standards for the manufacturing industry known as the ISO 9000 series. Solar panel manufacturers can be certified ISO 9000-compliant to indicate that they meet those standards. While lack of ISO certification isn’t necessarily an indicator of an inferior product, buying from a certified manufacturer is an indicator of quality. Solar panel durability metrics measure how well panels will hold up over time in real world conditions. The International Electrotechnical Commission’s (IEC’s) 61215 reliability standard evaluates panels by performing stress tests simulating the decades of outdoor wear and tear that solar panels encounter during their lifetime. These tests are designed to identify potential premature failure problems with solar panels, and panels that meet the standard are more likely to survive in the field. Snow can create a significant load of extra weight on a panel’s surface, and wind can apply strong pressures to the surface of solar panels. The higher a solar panel’s snow and wind load ratings, the better it is at tolerating these forces. Check solar panel ratings and reviews for the snow and wind load ratings, particularly if you live in parts of the country with greater seasonal variation. Manufacturers’ warranties are an important complement to solar panel efficiency, quality, and durability metrics, because they indicate both technical specifications and business practices. In the unlikely event that a solar panel problem occurs post-installation, a strong warranty ensures that your service and support needs will be covered. The amount of electricity a solar panel can produce declines slightly every year, with the most significant decline happening in the first year. This is typically referred to as “panel degradation.” Many solar panel manufacturers provide a power production warranty guaranteeing that their panels will retain a certain percentage of their production capacity over the first 25 years, usually no less than 80 percent. For this metric, a higher percentage guarantee is preferable to a lower percentage. Manufacturers also often provide a specific guarantee that output will only decline by a certain amount (generally no more than 0.7 percent) in a single year, known as the degradation rate. For this metric, a smaller percentage is better than a larger one. The materials warranty guarantees against failures due to manufacturing defects, durability, and environmental issues. Most solar panel manufacturers guarantee that their panels will not fail for 10 to 12 years, and some extend their materials warranty even further. Make sure you pay attention to the fine print – some materials warranties will cover the shipping and labor costs associated with replacing a panel, but others may require you to pay those expenses. When a manufacturer says that their panels have a 25-year power production warranty and a 10-year materials warranty, it can be difficult to understand how the two warranties work together. The power production warranty provides a guarantee that, while your panels are operational, they will produce a certain amount of electricity every year. The materials warranty guarantees that the panels won’t fail. However, the power production warranty only applies to operating panels. In the unlikely event that there is a manufacturing defect, it would most likely be evident before the materials warranty expires – the power production takes over from there. While a manufacturer’s products and warranty coverage are the most direct ways to evaluate solar panel reviews, their corporate profile can also tell you a lot about their products. Is the manufacturer focused solely on the solar industry? Where do they manufacture their panels? Do they deliver support with in-house staff or outsource to third parties? Do they maintain insurance coverage for their warranty services so that their warranties survive even if they go out of business? Now that you know about how to evaluate solar panel efficiency and quality, read more about selecting solar panels for your home and how to choose a solar installer.